Throughout the centuries, Chinese astronomers devoted substantial efforts towards predicting eclipses. However, like all similar efforts prior to the Renaissance, this could only be by empirical research. The earliest record of a solar eclipse comes from ancient Chinese history. Identifications of this event have varied from 2165 - 1948 BCE, though the favoured date is October 22, 2137 BCE. Ancient Chinese astronomy was primarily a governmental activity. It was the astronomer's role to keep track of solar, lunar and planetary motions and explain what they meant to the ruling emperor. 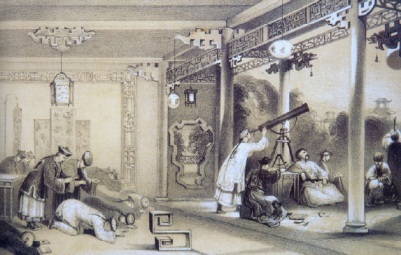 Eclipse observation in China around 1840. Astronomers calmly observe an eclipse and the servants, terrified, prostrate themselves on the ground to placate the bad omen. Credit: History of China and India © Mary Evans / Explorer. Source: Brunier and Luminet, Glorious Eclipses, Cambridge University Press. According to legend, the royal astronomers Ho and Hi dedicated too much of their time to consuming alcohol and failed to predict a forthcoming eclipse. Traditionally, the solar eclipse recorded in the Shu Ching (an historical classic text) was regarded as having occured the 3rd millennium BCE. On the first day of the month, in the last month of autumn, the Sun and the Moon did not meet (harmoniously) in Fang' ... so runs the text. The emperor became very unhappy because, without knowing that there was an eclipse coming, he was unable to organize teams to beat drums and shoot arrows in the air to frighten away the invisible dragon. The Sun did survive, but the two astronomers lost their heads for such negligence. Since then, a legend arose that no one has ever seen an astronomer drunk during an eclipse. Eclipses are also mentioned in sacred books such as the Bible. One of the best-known references to eclipses appears in the book of Genesis, which involves the journey of Abraham into Canaan: "And when the Sun was going down ... great darkness fell upon him." It is possible to relate this description with a computed solar eclipse occurring on May 9, 1533 BCE. 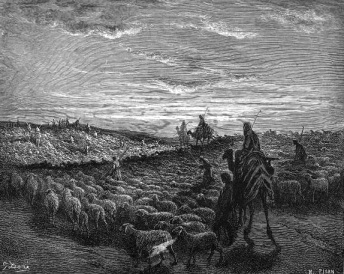 This image was produced by the French artist Gustave Dore and illustrates the journey into Canaan. c) Recently, astronomical references led two scientists to state that the total solar eclipse of 1178 coincided with the homecoming of Odysseus to rejoin Penelope after the Trojan War. Almost all classic scholars are skeptical of this correlation. If there was an eclipse, Homer must have had it in mind when he wrote of a seer prophesying the death of Penelope's waiting suitors and their entrance into Hades. The story does not mention an eclipse, but there are omens and a poetic description of a total solar eclipse. Odysseus arrived home, disguised in beggar's rags and in hiding before revealing himself. It happens that, when Penelope's persistent suitors sat down at noon for a meal, they started laughing and saw their food spattered with blood. At this moment, the seer Theoclymenus foretells their death, ending with the sentence, "The Sun has been obliterated from the sky, and an unlucky darkness invades the world." This description suggests a solar eclipse over Ithaca. As a matter of fact, Odysseus killed Penelope's suitors who wanted to steal his throne and afterwards he spent a long night of love with his wife. One passage in the Bible says: "And on that day, says the Lord God, 'I will make the Sun go down at noon, and darken the Earth in broad daylight'". The corresponding eclipse should have occurred on June 15, 763 BCE. A cross-reference is provided by an Assyrian historical chronicle known as the Eponym Canon. In Assyria, each year was named after a ruling official and the year's events were recorded under that name in the Canon. Under the year corresponding to 763 BCE, a scribe at Nineveh wrote this simple line: "Insurrection in the City of Assur. In the month of Sivan, the Sun was eclipsed." Historians have thus been able to use this eclipse to improve the chronology of early biblical times. It is believed that the Greek lyric poet Archilochus saw a total solar eclipse, which happened on April 6, 648 BCE: "Nothing there is beyond hope, nothing that can be sworn impossible, nothing wonderful, since Zeus father of the Olympians made night from midday, hiding the light of the shining sun, and sore fear came upon men."